Georgia's term-limited Gov. 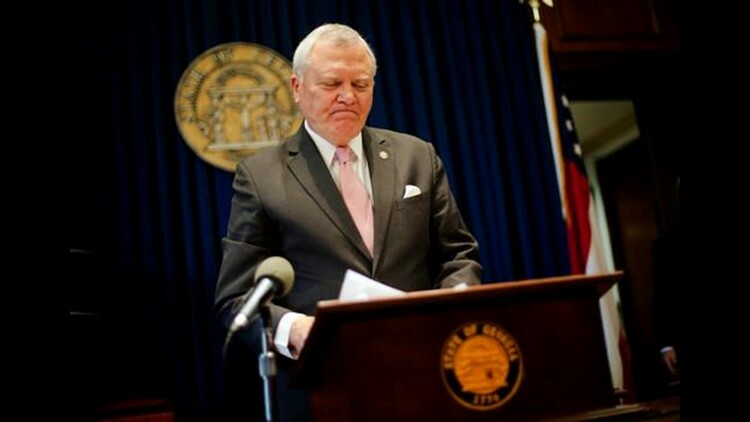 Nathan Deal took a stand against his own party and averted threatened boycotts by major corporations on Monday by announcing his veto of a "religious freedom" bill. "I do not think that we have to discriminate against anyone to protect the faith-based community in Georgia," the Republican governor declared. Religious conservatives had campaigned hard for Deal's signature, but the industries he has recruited to Georgia also applied pressure. The NFL warned that Atlanta's bid for the 2019 or 2020 Super Bowl could be in jeopardy. Technology firms, led by Salesforce CEO Marc Benioff, asked for Deal's veto. The Walt Disney Company, Marvel Studios and dozens of Hollywood figures vowed to take projects elsewhere, despite Georgia's generous tax credits for the film industry. Multimillion-dollar events and investments were threatened. Lawmakers around the nation are advancing "religious freedom" measures, which have passed at least one chamber in ten states: Florida, Georgia, Kansas, Kentucky, Mississippi, Missouri, South Dakota, Tennessee, Virginia and West Virginia. But Deal said only the First Amendment of the U.S. Constitution can protect people of faith — along with everybody else. "If indeed our religious liberty is conferred by God and not by man-made government, we should heed the 'hands-off' admonition of the First Amendment to our Constitution," Deal said. "When legislative bodies attempt to do otherwise, the inclusions and omissions in their statutes can lead to discrimination, even though it may be unintentional. That is too great a risk to take." Deal's veto stands in sharp contrast to North Carolina Gov. Pat McCrory's signature last week on a law that prohibits local anti-discrimination ordinances and obligates transgender people to use restrooms matching their birth certificates. The outcomes highlight the increasing conflicts between the twin pillars of the GOP's power structure — religion and business — in legislatures where Republicans have overwhelming majorities. McCrory, a 59-year-old Republican seeking a second term in Raleigh, must mobilize his party's core voters in November. Deal, now 74 and not planning to run again for office, is relatively immune to such pressures. Neither did Deal dwell on social issues in his re-election campaign; instead celebrating Georgia's ranking as the "No. 1 state for business." Emboldened by the boycott threats that forced Indiana to revise its "religious freedom" law last year, Georgia's business community formed a coalition of more than 500 companies, including Cola-Cola, Delta Air Lines and other top employers, to counter the measure. Many have large operations in Atlanta, a city proud of the pragmatic, "too busy to hate" image it fostered in the civil rights era. Back then, Coca-Cola's Robert Woodruff, former mayors William Hartsfield and Ivan Allen and other civic leaders wanted to avoid unrest that might spook companies deciding where to locate their regional headquarters. Georgia legislators had sparred for three years over protecting people whose religious beliefs clash with state and local laws. After the U.S. Supreme Court's decision legalizing gay marriage, proponents pushed even harder. Legislative leaders finally drafted what they considered a compromise, and only 11 GOP lawmakers joined every Democrat in opposition. House Speaker David Ralston said he respects Deal's "thoughtful consideration" but doesn't believe the bill permits discrimination. The measure included language modeled on the federal Religious Freedom Restoration Act. People claiming their religious freedoms are burdened could force state and local governments to prove a "compelling" interest in enforcing laws that conflict with their beliefs. It also would have protected clergy who decline to perform gay marriages, businesses that turn away customers for religious reasons, and churches and affiliated religious groups that cite faith as a reason for refusing to serve or hire someone. But Deal said he could "find no examples that any of the things this bill seeks to protect us against have ever occurred in Georgia." Georgia's General Assembly has adjourned for the year, but the issue is sure to come up again when lawmakers return in January. "We're not going to quit," said Mike Griffin, spokesman for the Georgia Baptist Mission Board. "We definitely don't want to have Gov. Deal listening to Wall Street and Hollywood over the citizens of the state of Georgia who expect him to support religious liberty." "Maybe there can be some constructive conversations that take place when the legislature's not in session," said Eric Tanenblatt, who served as chief of staff to former Gov. Sonny Perdue. "From an economic development standpoint, it was not helpful having news stories across the country talking about this issue in Georgia."